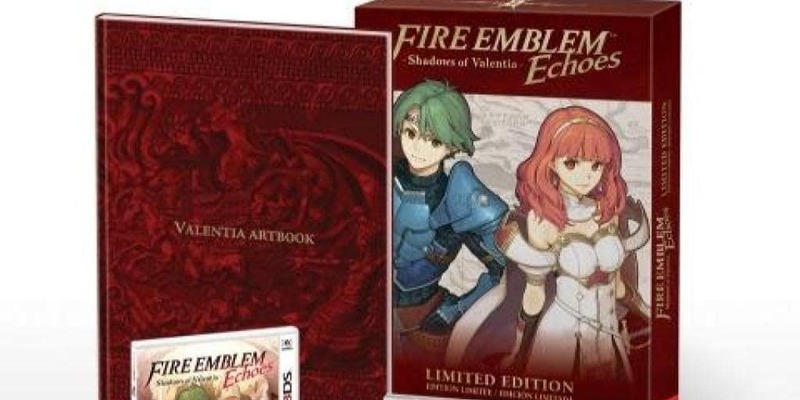 Nintendo Announces Fire Emblem Echoes: Shadows of Valentia Limited Edition | Nerd Much? Nintendo has announced the official Limited Edition of Fire Emblem Echoes: Shadows of Valentia, which includes the game itself, a hardcover Valentia Artbook, sound selection CD, pin set depicting characters Alm, Celica, and Marth, and a reversible cover sheet reminiscent of the Famicom version. The game will release May 19th exclusively on the 3DS for $39.99 and this Limited Edition is at the suggested retail price of $59.99. Shadows of Valentia is the remastered version of the original Famicom version, Fire Emblem Gaiden. Gaiden was a Japan-only release all those years ago, and now with Valentia the rest of the world can partake in the amazing strategy game. Valentia will not look much like Gaiden, however, with updated modern graphics, cinematics, and “free-roaming 3D dungeon environments.” The game series is usually based on top-down strategy gameplay, thus this addition of free-roaming will be sure to give fans something to talk about. If it’s good, we might even see more of it in future iterations of the game. Amiibo figures of Alm and Celica will also be available at launch for $24.99. These amiibo include new dungeons with exclusive loot and bosses. You can also use these amiibo to help out in battle as usual and by summoning an automatically controlled illusory hero for a single turn. In addition, as you level up of Alm and Celica, the information will be saved to their amiibo and the summoned units will get stronger. The Fire Emblem amiibo from Super Smash Bros. (Marth, Ike, Roy, Robin, Lucina and the upcoming Corrin amiibo) can be used in the same way with the illusory hero to help out in battle. Furthermore, you’ll be practically indestructible if you have any other amiibo, as they can also summon monster to your battlefield.